It may look like a lot of information, but in order for citizens to really be able to analyze and understand, much more needs to be provided. Here are ten thoughts about what more the Committee and the Legislature would supply if they were truly committed to a thorough review as part of this process. 1. Timing: The maps need to be available well in advance. This seems obvious, but how can observers be expected to provide meaningful comment on the revised version if they're not given time to review it? 2. Scale: The maps provided should reveal details. So far, the maps provided online have been 11 x 17" PDFs (example). So North Carolina's roughly 500-mile-wide expanse is represented in under 17 inches, requiring a scale of roughly (being generous here with my rounding) one to 1.8 million. So each inch on the map represents more than 28 miles. We've probably all seen photos of the previously used wall-size redistricting maps by now, so we know the legislature is capable of producing them. Some of the NCGA's recent legislative redisctriting maps had larger-scale insets in them, too, so you could at least sort of guess at where boundaries lie in some major divided counties. 3. Interactivity. Citizens should be able to zoom in to areas of interest. It's 2017, right? Even better than releasing large static PDFs would be to publish maps the way most entities do this century: dynamically. We know that NCGA staff can produce such map viewers, as they have done so here. 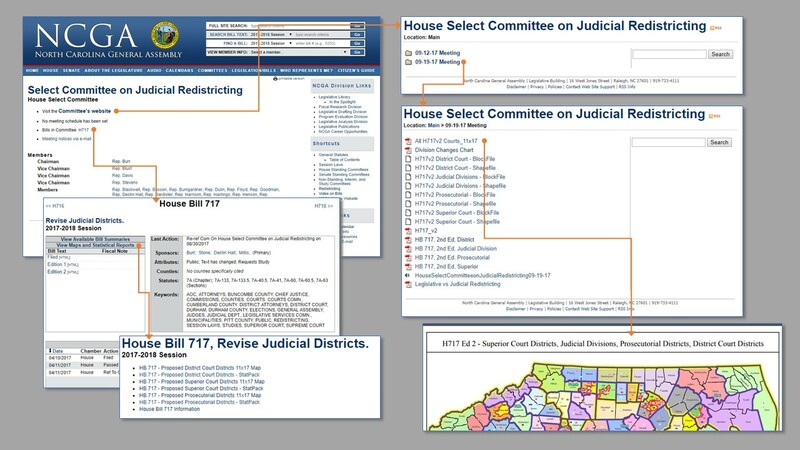 (As I just grabbed that link I noticed that the NCGA website itself observes that "Pre-formatted district maps satisfy many needs, but are limited in the amount of detail they can provide. With this viewer, one can interactively examine district boundaries." =]) Why not provide such an option for HB 717? They have at least provided GIS shapefiles, which enable proficient citizen mappers to create their own interactive maps (which I did for older maps here and here). But I may not have the time to create such maps next week – the legislature shouldn't leave it up to volunteers. 4. Reference data. What data was used to generate the statistics? Accompanying some of the maps previously released, there have been "stat pack" tables (scroll down in PDF) which provide selected demographic and political information for the districts. In the 2011 and 2016 redistricting efforts, the data used to create those tables, called "base data" or "reference data" were provided. Not so in 2017. For citizens to verify these numbers, or to evaluate alternative district designs, it's critical to have the same base data that the legislative staff are using. So far, my requests for these data have come up empty. 5. Judge localities. It's vital to know at least approximately where judges reside. So many of the concerns raised in the meetings so far have been somehow connected to the general location of the judges' homes. Note the emphasis on general – I am not suggesting we need home addresses, but knowing which precinct each judge lives in would go a long way to being able to understand about double-bunking, travel times, vacancies, etc. It's not hard to convert the addresses into the precinct ID code that contains those addresses. I understand judges' need for privacy, but when a typical NC precinct has thousands of people, there would be ample anonymity. Even zip codes would be better than nothing, but precincts (or VTDs) are the basic building blocks of these maps. 6. Judicial statistics. Isn't this effort purportedly about better delivery of justice? I'm not an expert in the judiciary, but I know that if I were asked to make these maps, I would want to know about caseloads, warrant requests, staffing resources, attorney numbers, backlogs, etc. Do you suppose that the folks making these maps didn't consult such figures, or just that they're not making them public? Either way, it seems fishy. It's perhaps revealing that the stat tables include demographic information and lots of election-related data, but no information about trials, court employees, or trends for other demands on judges' time. 7. Other geo-stats. 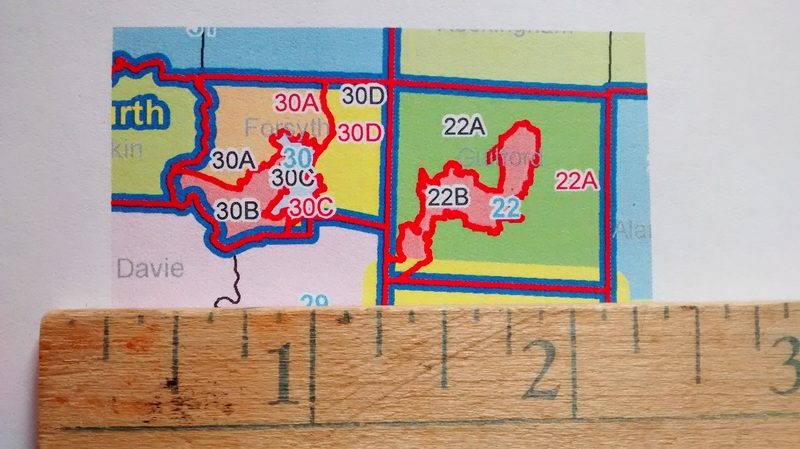 There are common measures of districts that are usually supplied that help identify gerrymandering. With the recent legislative redistricting, the NCGA provided data on criteria like districts' compactness, whether they divided municipalities, and which incumbent(s) live in which district. We know that staff can generate this output, and we know these are widely used standards by which the soundness of districts is evaluated. 8. Better comment options. If the only venue is 10AM Wednesday in Raleigh, that's pathetic. Again, from recent redistrictings, we know the legislature has the capacity to take written comments via the web. But no sign of that here (at least none that I've seen). We also know that they can offer other sites around the state. I recognize that the August 22 offerings were inadequate, but as someone who lives four hours' drive from Raleigh, having some satellite locations is better than none. 9. Change itemization. When new maps are revealed, observers shouldn't have to painstakingly comb through them to see what is different. It's standard modern practice when releasing new software versions, hardware models (iPhone X, anybody? ), and even statute revisions – in some places – to highlight what is new. I have a strong suspicion that such change documentation will not be provided on or before Wednesday, or if it is, it will be only in the draft statute itself, which essentially is a long nested list of mostly arcane geographic ID codes. An entity which was trying to be or appear transparent (which, I must say, this one apparently is not) would summarize the changes in at the least, easy-to-understand human-readable text, and preferably, with maps or visuals detailing the changes as well. 10. Criteria! How do they propose to evaluate the quality of the districts without any declared criteria by which to assess them? Perhaps they just like the way they look? Enough said on this one. I don't mean to suggest that I would support this legislation even if all these items were provided (as it's currently constructed, I assuredly would not). I feel compelled to point out all these gaps in the process which prevent thorough analysis, prevent public awareness, and prevent observers from being able to more intelligently and persuasively pick the bill apart.